Angry Birds Stars Wars Game Review - Download and Play Free Version! 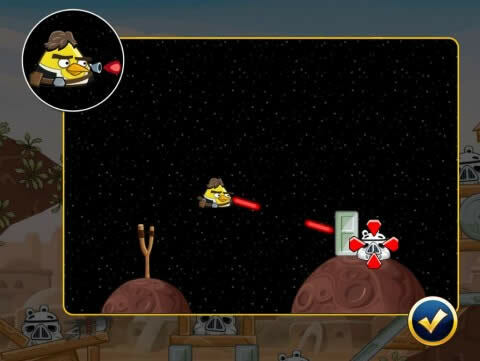 Use Luke, Obi Wan, Han, Chewi and More Star Wars Angry Birds to Defeat Vader and Blow Up the Pig Star! The Bad Piggies finally fight back. Challenging and superbly designed levels. Luck often plays a part in your success. The camera is starting to feel primitive. 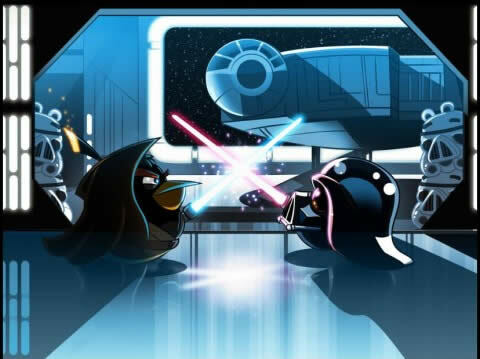 The Force Is Strong In Angry Birds Star Wars for Play on Your PC! The Empire has built a planet destroying super weapon. Your gang of Angry Birds heroes must use all their special abilities to escape Tatooine and venture to the mighty Pig Star and blow it out of the universe! 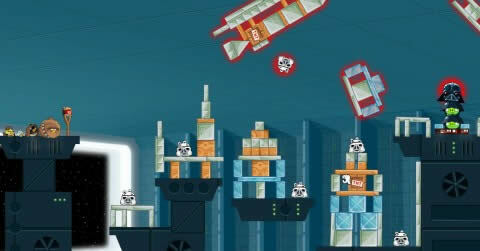 Angry Birds Star Wars follows the general storyline of the original Star Wars movie. You start with simple old Luke, a red bird with very little ability other than a kamikaze attack agains the Sandpeople piggies. But soon he’ll meet Obi Wan Kenobi, an old bird with a mastery of the mighty Force. As you progress, Luke will gain the ability to use a lightsaber. With it he can burn through obstacles and deflect lasers to defeat the Empire’s strongholds. Fortunately, Luke is not alone. He’ll team up with Obi Wan, Han, Chewie, and Rebel Alliance fighter pilots to help him destroy the Pig Star. And if Luke and co. is clever enough, they might just be able to find and unlock the secret R2 and C3PO birds! Who's this hiding down here ? Luke – original red bird gains the use of a lightsaber to burn through obstacles and deflect laser fire. Obi Wan Kenobi – the master Jedi uses wave of the force to blast anything out of his way. Han Solo – the best shot in the star system fires 3 laser blasts wherever you want. Good thing Han doesn’t miss! The Imperials can't hide from Han's dead accurate laser fire! Fight Through Tatooine, Space, and the Pig Star Itself! 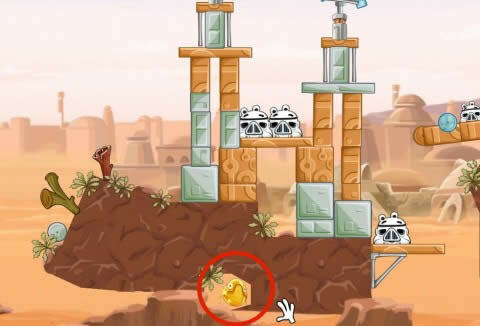 In Angry Birds Star Wars, you’ll start on the planet Tatooine, the homeworld of Luke Skywalker. You’ll fight piggy sandpeople and stormtroopers hiding out in desert moisture evaporators, sandcrawlers, and other fortress formations. When the storm troopers start shooting, watch out because their laser fire can knock your birds off course. But you’ll soon find out you can actually turn their lasers against them! Imperial blaster fire is no match for a Jedi Master wielding the Force! After escaping Tatooine, you’ll find yourself fighting the Imperials in space. Use your birds to navigate the gravity wells of planets and asteroids to fling your forces into the Imperial ranks. Fans of Angry Birds Space will enjoy the gravity defying puzzles that await you as you fend off tie fighters and turbo lasers. Turbo lasers and Tie Fighters are no match for the pilots of the Rebel Alliance! Navigate the Pig Star to Take on Vader Himself! Captured by the Pig Star’s tractor beam, the Millenium Falcon is pulled into the heart of the Pig Star. Chewbacca will join you and devastate the Imperial strongholds. Use Obi Wan’s force ability to make way for Han’s lasers. At some point you’ll encounter Vader himself and his use of the Dark Side to thwart your attacks! Vader will use the Dark Side to thwart your attacks! Another added content segment is the MIllenium Falcon. While fleeing from the Empire's blockade of Hoth, the Falcon hides in a nearby asteroid field. However, what they find hiding on the lonely rock in space is more than they bargained for! After you complete the Millenium Falcon levels, you can join Luke on Dagobah as he is trained by the Jedi Master Yoda. Cloud City is up next and is planned on being released the week of March 28, 2013. Fans of Angry Birds and Star Wars will love the clever blend of these two great franchises for Angry Birds gameplay you’ve never seen before! Experience over 80 levels of puzzle action! Unlock bonus levels by earning more stars on each level! Are you good enough to find C3PO and R2 who are hidden in the game? Experience the sounds and music from the original Star Wars series! Free updates with extra levels for anyone who buys the game! 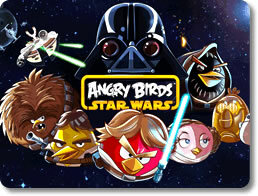 An Epic Battle Awaits You - Download the Angry Birds Star Wars Demo and Get Playing! You can play a limited number of levels in the free demo so what are you waiting for! Download the game and experience the best Angry Birds game yet! Will you overcome the Dark Side and take out the planet destroying Pig Star? May the Force Be With You! Obi Wan’s force powers and Han’s blaster fire will go wherever your cursor is pointing. Shoot down, up, diagonally and even backwards! Laser’s ricochet off certain surfaces. 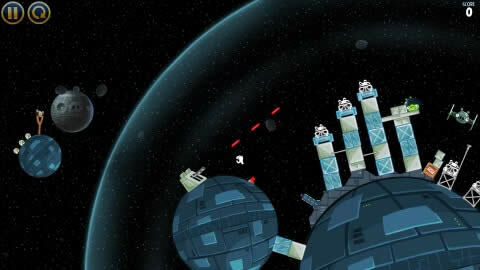 Turn the Empire’s weapons against them by knocking reflective obstacles in the path of the lasers! The story begins a long time ago in a far away galaxy. An evil star-spanning empire has been ruling over its citizens with an iron fist. With an insidious Emperor at the helm, a powerful wielder of the Force at his side, and a moon-sized planet-destroying battle station called the Death Star under their command, everyone lives in constant fear. The only hope for the galaxy lies within another Force user, who happens to be a young and humble farm boy residing on a backward desert planet. Is this Star Wars? Nope! This is yet another entry in Rovio’s smash hit Angry Birds franchise. Angry Birds Star Wars pulls out all the stops to feel distinctive from the rest of its brethren by wrapping everything that the series has built upon in a Star Wars-flavored package. It may be the same kind of game we have played or heard about countless times before. However, it mixes things up enough to feel fresh and goes on to become one of the more hilarious parodies of Star Wars ever seen in years. Angry Birds has always had a distinct cartoony aesthetic infused with a lot of personality. 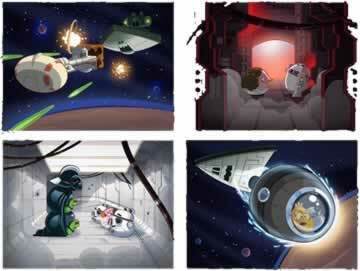 Angry Birds Star Wars keeps it up beautifully even while it mimics the style of George Lucas’ original trilogy. All of the birds are made to look like Star Wars characters. Red takes on the role of Luke Skywalker, Bomb the black bird becomes Obi-Wan Kenobi, Chuck the yellow bird is Han Solo, Terence the big bird gets Wookified into Chewbacca, and Stella the pink bird dons Princess Leia’s hair buns. Meanwhile, the Bad Piggies take on the assorted roles of the antagonistic figures, including petty alien thugs, Greedo, the Stormtroopers and even Darth Vader himself. It does not stop with the characters. All the levels are designed to resemble the iconic Star Wars locales. The game starts off on Luke’s home planet of Tatooine before letting you smash up the likes of Hoth, Cloud City and a porcine rendition of the Death Star. The birds don’t just squawk unintelligibly either; Han Solo gives us a boisterous “Wahoo,” while Chewie growls like a Wookie should. The game over screen doesn’t just have a pig laughing evilly at your failure, but a pig dressed up as Darth Vader cackling at you in his reverberating and metallic voice. Even the music follows suit, being the absolutely perfect blend of both Star Wars’ heroic theme song and the playful tune we associate with Angry Birds. Needless to say, Rovio took everything we know and love about Star Wars, ran with it, and had a lot of fun in the process. It makes Angry Birds Star Wars all the more fun to play as well. Thankfully, the Star Wars trapping are not the only things going for this game. They’re just the icing on the cake. 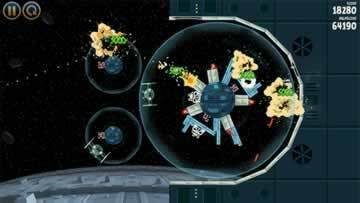 All things considered, Angry Birds Star Wars would have been a great entry to the series if it only retained the new features and levels. At first breath, this plays just like any other Angry Birds game. Your birds and their slingshot are one side of the screen while the Bad Piggies and their assorted contraptions and ramshackle fortresses are on the other. It is up to you to destroy all the pigs by flinging the birds at them with great force. Each bird has his or her own unique properties, attributes and abilities that make them more suitable for different tasks and materials. For instance, Red is great for knocking down just about anything while the blue triplets excel at demolishing glass. Things look good and familiar so far. However, the birds have completely different abilities. Just as their appearances have all been made over to look like the heroes and villains of Star Wars, so too have their skills. Red is no longer just a basic projectile; true to his new Jedi nature, he now whips out a light saber that can destroy everything in an arch in front of him. Bomb no longer blows up like a bomb, but unleashes a Force wave that can scatter debris and pigs alike. Chuck trades his speed boost for a blaster which can be used to vaporize blocks and snipe well-nested pigs. 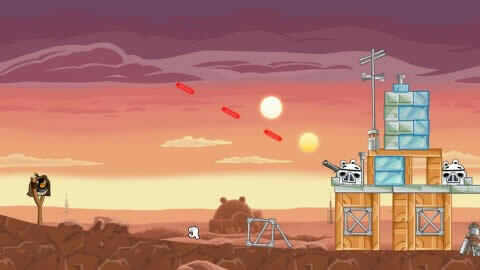 Aside from revamping the old birds, Angry Birds Star Wars also introduces a couple of new ones. They come in the form of everyone’s favorite hapless droid duo, R2-D2 and C-3PO. After delivering the obligatory robotic scream from being launched, the former can turn pigs and buildings alike into dust with an electronic zap. Meanwhile, the nervous wreck that is C-3PO can become a literal wreck when he falls to pieces with the click of your mouse or a tap of your screen. His pieces can then be used to cause even more damage to the scenery. Both of them are featured in the game’s bonus levels, which you can only access by acquiring stars in the regular stages. These stages are unique and challenging on their own and well worth the time it takes to unlock. For the longest time, the Bad Piggies have been standing their ground to the birds’ unending assaults. They can erect crude fortresses, build not quite impenetrable walls, and yet never quite had the heart to fight back. 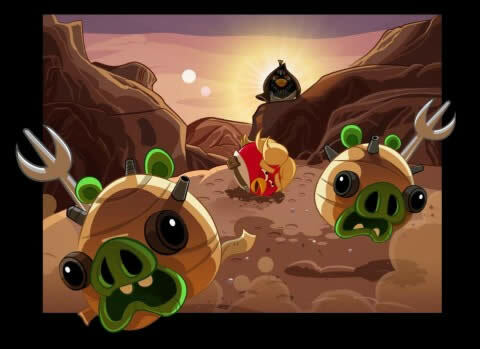 That ends in Angry Birds Star Wars; for the first time in the series, the porkers finally return fire! Some levels feature piggies that are armed with blasters which they’ll use to shoot a constant stream of lasers. They won’t necessarily aim at you; they’re Stormtroopers and don’t quite know how to aim after all. However, you still need to time your launches properly because nothing messes up the flight of an Angry Bird more than a face full of red-hot light. The shooting mechanics make for some really interesting level designs. Although the pigs’ lasers will often serve as obstacles, they can also be used to your advantage. The pigs will keep on firing no matter what angle they’re rotated at, so you can use them to take out their comrades and structures for you! Metallic surfaces also reflect laser blasts, which can allow you to pull off some cool shots that bounce all over the screen. This applies to Chuck’s own laser blasts as well. A lot of levels are in fact designed to capitalize on trick-shooting, which adds an element that had gone unexplored in previous Angry Birds games. In fact, much has been done to revamp the design of the puzzles. Angry Birds Star Wars may not bring as much innovation to the table as Angry Birds Space did before it, but it’s definitely no tired rehash. The Bad Piggies use more wild contraptions than ever before. There are rigged explosive that are designed to cause destruction to very specific areas of the map. Springboards are ready to launch hapless pigs in the air and to their doom. One stage in Tatooine has you contend with a swinging crane, and the detention levels of the Death Star are loaded with crushers. Speaking of Angry Birds Space, the gravity mechanics from that game return in full force! Birds fire straight and true when they’re fired in the vacuum of space. Any objects they collide with can fly or drift into any direction, making them useful for taking out wayward pigs. Gravity only exists around planets and they’ll pull anything that comes too close straight to their surfaces, bird and pig alike. These puzzles, combined with all of the previous additions, makes Angry Birds Star Wars not only one of the most varied entries in the series, but one of the most challenging too. It’s not a hard game to beat, but getting a three-star rating in each level will definitely take some time. No game is perfect, Angry Birds Star Wars included. Like always, luck can be the ultimate decider between victory and defeat and it stinks like a scruffy nerf herder when the latter happens. More than that, the most notable issue in the game has to be the camera. Star Wars requires more precision than any other Angry Birds game to date. You need to know what angle to launch your birds at, you need to know when to execute their abilities, and for the more directional-based powers like Chuck’s blaster or Bomb’s Force wave, you need to know where on the screen you’ll want them to go. Old Angry Birds games always allow you to pan the camera to get a bead on things and this one is no different, but with all the new things to keep in mind, more tools are needed to plan out your destruction properly. Zooming controls would do wonders for that and it’s high time for Angry Birds to consider expanding its camera controls. Although it seems that not everything has been updated nearly as much as they should have been, Angry Birds Star Wars is nevertheless an excellent addition to the series and a wonderful game in its own right. Everything built up over the course of the series has been incorporated into a single package, it brings a few new things to the mix, and it’s challenging without being frustrating. The birds’ new abilities are a lot of fun to use and the Star Wars theme is executed both flawlessly and hilariously! Fans of Angry Birds and Star Wars really should not miss this. In fact, anybody who fancies him or herself as a gamer should not miss it.